When my friend Maresa comes to visit from Cape Town, she often brings fresh lavender from her mother’s garden in Stellenbosch. Her mother makes an absolutely delicious orange and lavender ice cream, and I thought it would be nice to try out just a lavender ice cream too. I think it might go nicely with a vanilla spunge cake or pancakes. I like light ice cream myself, and find many recipes contain too much egg and sugar. So this is a very milky ice cream, made with half milk and half full cream, no eggs, and only a little sugar. I used the little lavender I had right now, and the taste is quite subtle. If you have more lavender, then you could easily add more for a more pronounced taste. 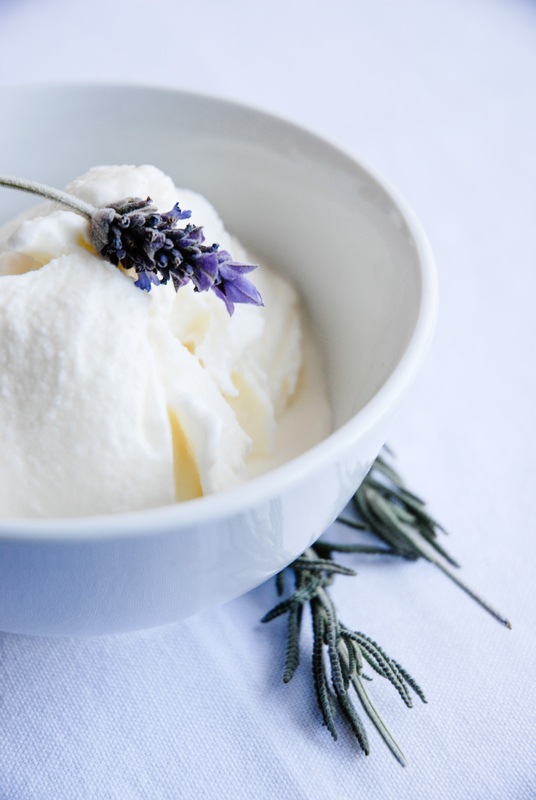 Pour milk and cream in a bowl and add the fresh lavender flowers. Soak overnight in the fridge. Pour mixture through a sieve and discard the lavender flowers. Whip the mixture thick (it won’t get very thick, but you can beat a bit of air into it). Pour cold mixture into ice cream machine and churn according to machine instructions. Keep in freezer. You can probably make this without an ice cream maker too, putting the mixture in the freezer and bringing it out every now and then to whip it to make sure it doesn’t crystallize. However, when the mixture has this much milk in it and no eggs, it might be difficult to get a good ice cream texture.